The launch of a new entry in The Elder Scrolls series isn't just a game release, it's the beginning of countless adventures; the origin point for millions of tales waiting to be told. Let's hear what stories of Skyrim the assembled game reviewers have to share. From imagination-powered origins rises the Dovahkiin, the fabled hero destined to protect the realm of Skyrim on the continent of Tamriel from the reemergence of the greatest evil power the world has ever known. 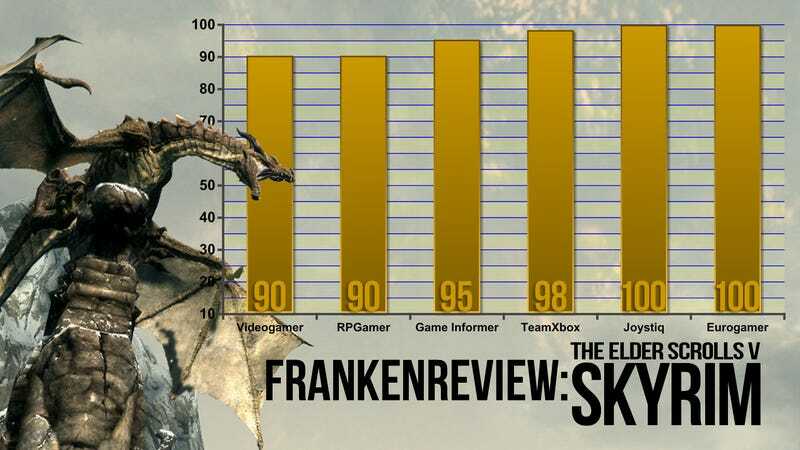 Over the past weeks dozens of video game reviewers have crafted their weapons and set them loose upon this expansive virtual landscape, making a name for themselves among the people and creatures of this vibrant land. They've explored the darkest depths and highest reaches of Bethesda's latest, adventure and excitement waiting at every turn. Now they've assembled their exploits and encounters into a series of reviews, assigning number values to their legends, as foretold by prophecy. So it was written, so have I Frankenreviewed. Let us read. Because we at VideoGamer.com care about our audience, we'd like to offer anyone planning to play Elder Scrolls V: Skyrim a couple of pieces of advice. First off, if you have any long term commitments like say, a job or friends or a significant other, we suggest you ring them to make your excuses now - you don't want to get sacked or dumped over a video game, and letting your friends think you've died or been kidnapped due to lack of communication is just plain rude. Furthermore, it might be worth making sure that your gas and electricity bills have been paid, and that you have enough provisions to last you until spring. You're going to need time for Skyrim and lots of it. Those who have played Oblivion, or either of the most recent Fallout games, will be right at home with the console controls here. It follows the same first-person perspective of those titles while again presenting an optional third-person viewpoint. Players attack, jump, or cast all in real time via a rather simple interface that allows for a lot of diversity in play styles. There are times when the first-person perspective makes combat a bit chaotic, especially during fights in crowded areas or tight spaces. Also, aiming can be inaccurate for those not used to first-person style gameplay, but battle is never unmanageable. All of Bethesda's releases this generation have given me that "I'm not in Kansas anymore" feeling once the open world is revealed, but not to the degree that Skyrim does. This world has that Rapture or Arkham Asylum allure, and is as much of a star of this adventure as any of the characters, dragons, or gameplay. While Skyrim's landscape doesn't have the fantastical elements of the aforementioned places, excitement and a true sense of discovery are tied to the secrets hidden within. I climbed a mountain to find a long-forgotten tomb, crossed a frozen tundra in search of powerful masked adversaries linked to one of this world's greatest mysteries, and found myself riding my steed with haste toward a village under dragon attack. Much of the content the world offers is worth devoting time to, whether that leads to an enchanted sword or a settlement filled with side quests. The way you pick your character and the way you level up as you go has changed for the better, in my opinion. Gone are the needs to pick major skills and things of that nature. You pick your race, customize your appearance and you are good to go. Your race choice will determine some special attributes though, so it's not like every time you start you are the same person as everyone else. From there, you have a myriad of skills accessible from your menu, where you can track your progress in specific areas. A welcome feature from my perspective is the fact that you don't have to divvy up points in skills as you go. Typically speaking, using those skills is the way to improve them, however you can also receive training for them from characters that you meet throughout your time in Skyrim. One example of using a skill and improving it is with lock-picking. You don't just make progress in the lock-picking skill by successfully opening chests and doors; even failed attempts garner some advancement. This makes complete sense to me, as it is through failure as well as success that we can learn how to improve our techniques. You learn from your mistakes. It evokes a word that's overused in reviewing of all kinds: one that's best kept in the cellar in a plainly marked box and reserved only for the most special of occasions. For Skyrim though, I'd like to blow the dust off it, open up the lid, and enjoy a masterpiece with you. And what of my own review? I give it a 'wait until next week, then I'll tell you'.